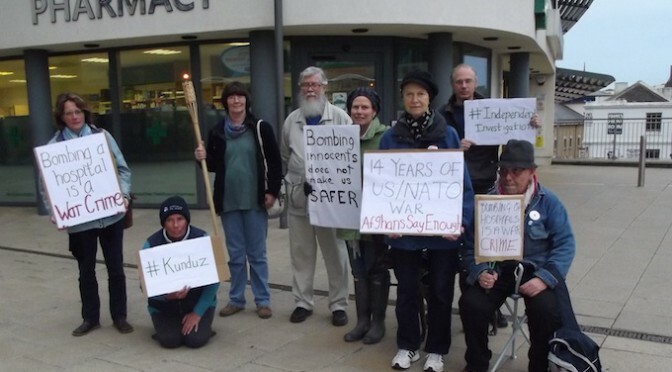 14 year anniversary of the US/NATO led war in Afghanistan we urge everyone to vigil outside their local hospital in remembrance of the 22 people killed during the attack on the Médecins Sans Frontières hospital in Kunduz, North Afghanistan. Support Médecins Sans Frontières who are calling the attack a war crime and are demanding for an independent investigation. The US have described the attack as “collateral damage” but keep changing their story daily. 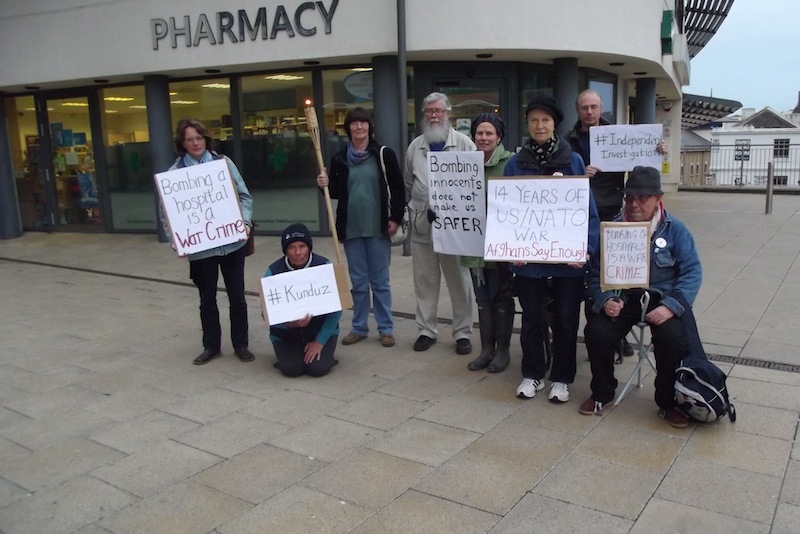 Suggested sign for vigil: “Bombing a hospital is a war crime, the same is true in Afghanistan”. Stand in solidarity with Afghans who have endured 35 years of war, who say they have had ENOUGH of violence, who say that life now is more insecure than under the taliban. Take photos and send a press release to your local newspaper. Before the 2003 Shock and Awe bombing in Iraq, a group of activists living in Baghdad would regularly go to city sites that were crucial for maintaining health and well-being in Baghdad, such as hospitals, electrical facilities, water purification plants, and schools, and string large vinyl banners between the trees outside these buildings which read: “To Bomb This Site Would Be A War Crime.” We encouraged people in U.S. cities to do the same, trying to build empathy for people trapped in Iraq, anticipating a terrible aerial bombing. Tragically, sadly, the banners must again condemn war crimes, this time echoing international outcry because in an hour of airstrikes this past Saturday morning, the U.S. repeatedly bombed a Doctors Without Borders hospital in Kunduz, a facility that served the fifth largest city in Afghanistan and the surrounding region. U.S./NATO forces carried out the airstrike at about 2AM on October 3rd. Doctors Without Borders had already notified the U.S., NATO and Afghan forces of their geographical coordinates to clarify that their compound, the size of a football field, was a hospital. When the first bombs hit, medical staff immediately phoned NATO headquarters to report the strike on its facility, and yet strikes continued, at 15 minute intervals, until 3:15 a.m., killing 22 people. 12 of the dead were medical staff; ten were patients, and three of the patients were children. At least 37 more people were injured. One survivor said that the first section of the hospital to be hit was the Intensive Care Unit. “Patients were burning in their beds,” said one nurse, an eyewitness to the ICU attack.”There are no words for how terrible it was.” The U.S. airstrikes continued, even after the Doctors Without Borders officials had notified the U.S., NATO and Afghan military that the warplanes were attacking the hospital. Taliban forces do not have air power, and the Afghan Air Force fleet is subordinate to the U.S., so it was patently clear that the U.S. had committed a war crime. The U.S. military has said that the matter is under investigation. Yet another in an endless train of somber apologies; feeling families’ pain but excusing all involved decision makers seems inevitable. Doctors Without Borders has demanded a transparent, independent investigation, assembled by a legitimate international body and without direct involvement by the U.S. or by any other warring party in the Afghan conflict. If such an investigation occurs, and is able to confirm that this was a deliberate, or else a murderously neglectful war crime, how many Americans will ever learn of the verdict? War crimes can be acknowledged when carried out by official U.S. enemies, when they are useful in justifying invasions and efforts at regime change. One investigation the U.S. has signally failed to carry out would tell it how much Kunduz needed this hospital. The U.S. could investigate SIGAR reports (“Special Inspector General for Afghanistan Reconstruction”) numbering Afghanistan’s “U.S. funded health care facilities,” allegedly funded through USAID, which cannot even be located, 189 alleged locations at whose coordinates there are demonstrably no buildings within 400 feet. In their June 25th letter they astoundingly write, “My office’s initial analysis of USAID data and geospatial imagery has led us to question whether USAID has accurate location information for 510—nearly 80 percent—of the 641 health care facilities funded by the PCH program.” It notes that six of the Afghan facilities are actually located in Pakistan, six in Tajikstan, and one in the Mediterranean Sea. Now it seems we’ve created yet another ghost hospital, not out of thin air this time but from the walls of a desperately needed facility which are now charred rubble, from which the bodies of staff and patients have been exhumed. And with the hospital lost to a terrified community, the ghosts of this attack are, again, beyond anyone’s ability to number. But in the week leading up to this attack, its staff had treated 345 wounded people, 59 of them children. The U.S. has long shown itself the most formidable warlord fighting in Afghanistan, setting an example of brute force that frightens rural people who wonder to whom they can turn for protection. In July of 2015, U.S. bomber jets attacked an Afghan army facility in the Logar Province, killing ten soldiers. The Pentagon said this incident would likewise be under investigation. No public conclusion of the investigation seems ever to have been issued. There isn’t always even an apology. We should affirm the Afghans’ right to medical care and safety. The U.S. should offer investigators unimpeded access to the decision makers in this attack and pay to reconstruct the hospital with reparations for suffering caused throughout these fourteen years of war and cruelly manufactured chaos. Finally, and for the sake of future generations, we should take hold of our runaway empire and make it a nation we can restrain from committing the fathomlessly obscene atrocity that is war. What Do Afghans Think About Trump?